Indian MFP, Copier and Document Printer shipments volume reached 0.82 Million units in CY Q4 2013, a decline of 6% over the previous quarter. HEWLETT PACKARD emerged as the leader in the Indian MFP and Printer market. The Indian MFP (Multi-Functional Printer), Copier, Dot-Matrix and Serial Inkjet Printer market registered a Total Unit Shipments of 0.82 Million units in CY Q4 2013, representing a decline of 6% over the previous quarter. HEWLETT PACKARD emerged as the market leader in MFP and Printer market whereas, RICOH captured lion’s share in the copier segment. In CY Q4 2013, MFP segment registered an increase of 4% in terms of unit shipments, whereas Printers exhibited a substantial decrease of 16% as compared to the previous quarter which can be well explained by the increased usage of MFP by the Indian consumers. In MFP segment, top three player’s captured 92% market share. In Printer and MFP segment, 600 x 600 print resolution lead with around 28% market share. Touchscreen enabled Copiers registered 29% share of the total Copiers market. In CY Q4 2013, the WI-FI enabled devices registered around 13% market share as compared to 10% in the previous quarter. 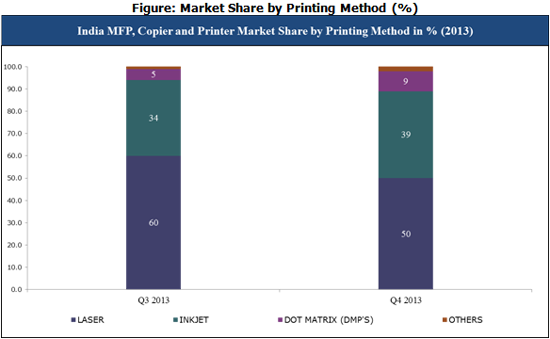 Whereas, in the MFP segment, Duplex printing market registered an increase of more than 6% in terms of unit shipments. In the current quarter, the Indian consumers have shifted their preference towards MFP printers over the normal document printers. This trend can be well observed in the rising market share of MFP printers.